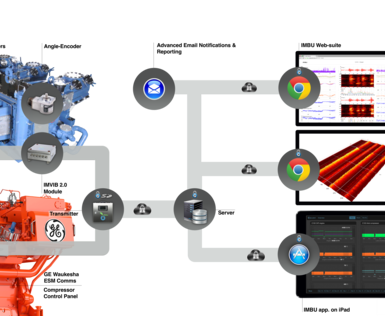 Quorex is specialised in remote industrial asset performance monitoring. In doing so, Imbu supports end-users with optimisation of O & M practices so as to maximise operational efficiency of equipment. Quorex’s affiliated company - IMBU BV (Eindhoven, Netherlands) - has developed a line of remote condition monitoring devices & software & services. These have been designed and deployed into world’s most challenging locations like the Niger Delta (Nigeria) and the steppes of Kazakhstan. Part of IMBU’s scope is configuration and operation of a ‘digital twin’ compressor (or pump or other). This ‘digital twin’ is a highly accurate digital representation of the “as designed” physical compressor set and predicts e.g. exact PV curves taking operational conditions into account (pressures, temperatures, gas-composition etc.). This allows a continuous trending of how much the actual measured performance is deviating from the engineered “twin’s” baseline performance. IMBU supplies its condition monitoring products to end users but has also been selected as supplier to a large compressor OEM (manufactures world’s largest reciprocating compressors for high-spec refinery applications). IMBU is the first monitoring specialist making these advanced ‘refinery style’ analytics available to the field gas compression market at an affordable price level. IMBU has references available where it equipment has been used to improve compressor availability by double digit percentages. Our client in Kazakhstan uses IMVIB to monitor all 15 of their field gas compressors. Their primary production asset is the Chinarevskoye oil-field, located in the North-West of Kazakhstan. Its operation includes an LPG-plant with several reciprocating and screw-compressors. GFS Corp develops systems that allow large, high horsepower diesel engines to operate on a combination of natural gas and diesel fuel. Their bi-fuel systems are used worldwide in mine haul trucks and in the stationary power sector to reduce fuel costs and emissions. Our client operates several oil-fields in the Niger Delta. They use reciprocating oil-pumps in order to operate the oil-transmission pipelines. IMBU provides the client with a valuable live data-stream allowing detailed analysis of operational issues which were previously unavailable. This has resulted in multiple improvements and drastically increased the overall pump availability.